There is a bit of ground fog this morning, so it is a little cooler than the past few days.I am walking out along Mill Creek on the east side. 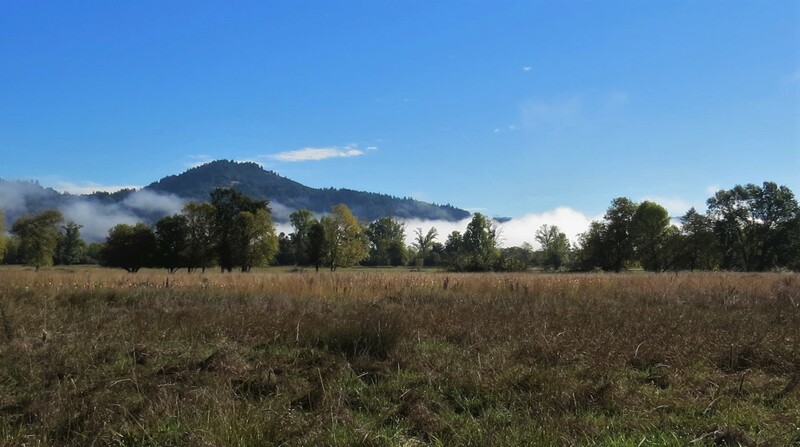 It is a fine riparian corridor with lots of streamside vegetation, such as Oregon Ash, Willow, and Leaf Maple, There are small flocks of Yellow-rumped Warblers, with Ruby-Crowned KInglets, Hutton’s Vireos, Chestnut-backed Chickadees, and even some tiny Bushtits flitting about calling to each other when suddenly they begin to twitter loudly. It is a certain kind of twittering that gets my attention immediately. This is because it is the bird’s way to call the alarm. I quickly look up and scan the area. There is a dark, very fast falcon flying towards where I am standing. Luckily for me, this bird lands in the tree above my head and I can take photos of it. It is a magnificent Peregrine Falcon, Falco peregrinus. The small birds have reason to be afraid of this powerful hunter. Its’ keen eyes look down at me and then all around surveying the landscape. 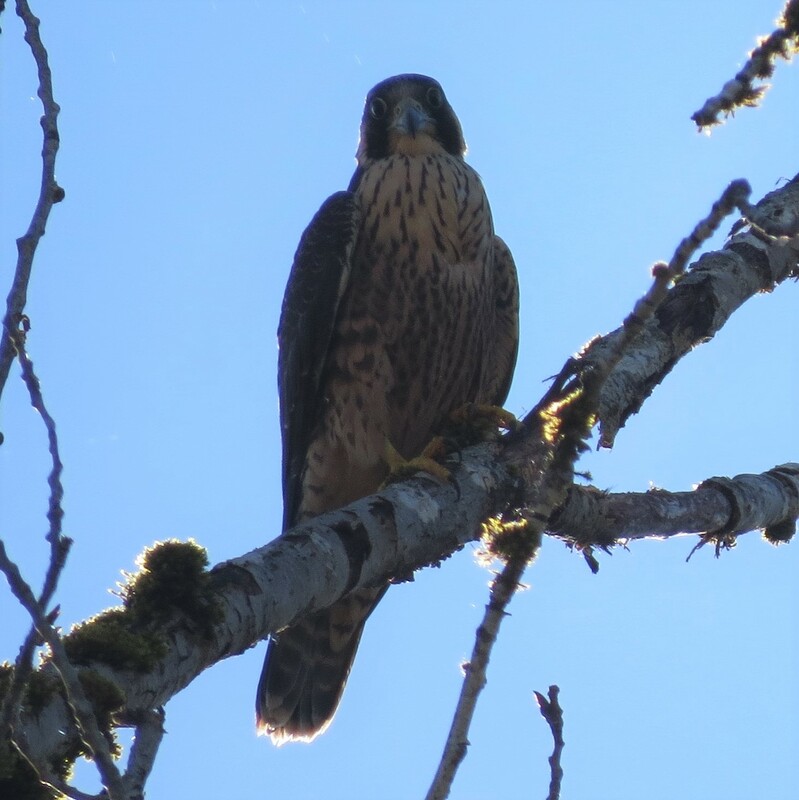 According to Cornell University, this Falcon has been documented preying upon at least 450 different species of birds including, birds as large as Sandhill Cranes and as small as hummingbirds! For a bird only 14 to 19 inches high that is an astounding record. They also may be the fastest bird in the world and can reach speeds of 238 mph on a dive. Peregrines average 24 to 33 mph increasing to 67 mph when in pursuit of prey. All of this is crossing my mind as I look up at this extraordinary bird. The trees have gone eerily silent as it looks out. This is one of our resident falcons, along with American Kestrels, and Merlins. The other species we have, the Prairie Falcon, is a winter migrant through our valley and will hunt and eat Peregrine falcons. As I watch, the Peregrine takes off, heading south towards the Willits Treatment Plant and I think about the ducks there it may eat. 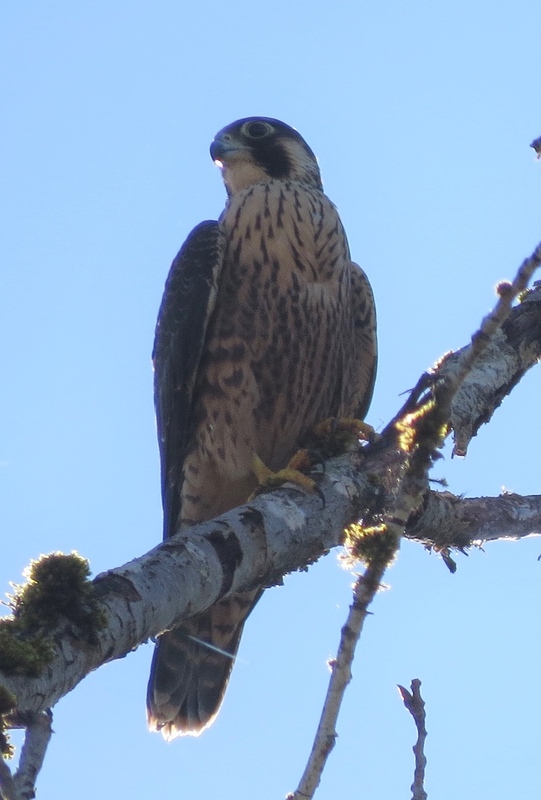 They will probably not feel as fortunate as I to have this Peregrine living in our valley! The bird disappears quickly into the distance and in a short few minutes, the sounds of the other birds return to normal.